Warning: if you’re going to drive through anywhere in Nevada, be aware that there are vast distances with zero gasoline involved. 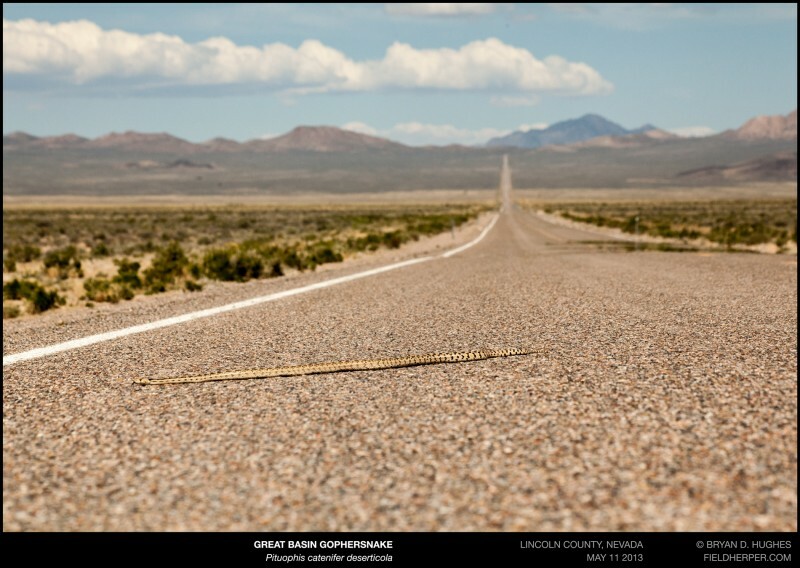 After driving past numerous snakes this particular May morning, scared to stop because I had to get another 70 miles on this quarter tank of gas somehow, I saw this gophersnake. I’d seen quite a few great basin gophers on this trip, but enough is enough; I needed to stop for something. The result is one of my favorite road shots I’ve ever taken, if not my absolute favorite. Perfectly straight road littered with Area51 junkshops and absolutely nothing else – except thousands of square miles of untouched habitat. Unlike most snakes I find on a road, I left this one to just crawl off on its own. In 4 hours I’d only seen one other car, and I didn’t expect any others any time soon. I made it to a gas station, too, on fumes. Whew! This entry was posted on Friday, May 23rd, 2014 at 8:56 am	and is filed under Field Herping, Field Trips. You can follow any responses to this entry through the RSS 2.0 feed. You can leave a response, or trackback from your own site.